“papyrus”, a group exhibition by four artists who are familiar with the paper medium was held in Sept – Nov 2010. Each artist demonstrated their own unique relationship between paper and their world of creation. Mathilde Roussel-Giraudy is a French artist who combines drawing, printmaking, sculpture, book art, and photography for her creation. She explores the interconnected value of identity and memory. On this exhibition, she showed two of her styles in the themes of memory and dream. Mary Bucci McCoy is a Beverly, MA, based artist who had actively created a community of artists, such as a membership in her town’s culture council. As an artist, she continuously works through acrylic painting on wood panel and paper, and she has exhibited throughout New England. On this exhibition, AG gallery features her works on Okawara paper, a soft and strong Japanese paper. Susan Belle is a New York-based artist who studied at FIT and SUNY Purchase College. For this exhibition, you will see her small drawings for a zine called “Shuttle Cakes.” Inspired by decadent desserts and science fiction illustration of the 1920’s and 30’s, her black and white drawings contain highly ornate space shuttles drifting through microcosmos of celestial dust. Her work has been shown in periodicals, such as Worn Fashion Journal. Edda Tara Hansen was born in Hong Kong and moved to London as a teenager. She finished her master’s degree in art at Central Saint Martins College of Art. Currently, she lives in Brooklyn. 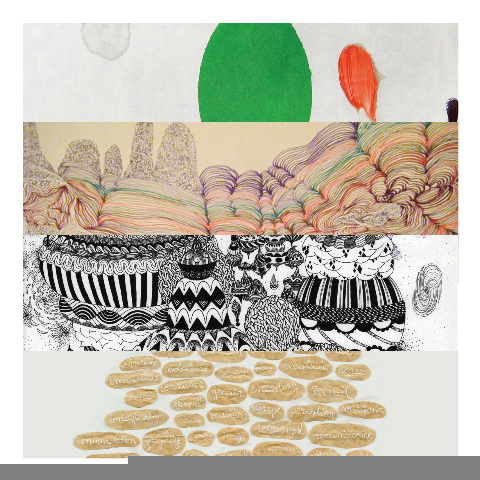 Her signature artwork is pen and ink drawing on large pieces of paper in multiple colors. The drawings take different meanings depending on the viewers distance from the works.